Judd home built in 1916. Still standing on Judd Road in Brackendale. 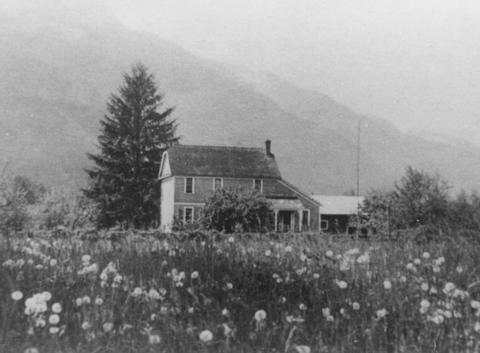 Although not the oldest structure in Squamish, the Judd Home (1199 Judd Road) is regarded by many to be one of the District's primary heritage resources, providing an important anchor in reconstructing the early history and development of Brackendale and Squamish. It is in association with the Judd Home that many other local heritage sites are best interpreted. Henry Judd (or Harry, as he was also known) and his wife Anne were among that small group of settlers which included the Robertsons, the Raes, William Mashiter, E.B. Madill, George Magee, Tom Reid, and a few others who are now regarded as the Pioneers of the Squamish Valley. Although not a "grand" structure, the Judd Home is nonetheless an attractive example of the functional charm of Western farm homes of the early part of the century. Perhaps more importantly, the Judd home and the lovely surrounding property on which it stands are a reminder of the farming history of Brackendale, and the industriousness of the earliest settlers in Squamish. Original use: Private residential / farmhouse. Current condition: Although some renovation has occurred, the Judd Home maintains most of its original form. Some restoration would be required to bring it back to its original condition. The large property on which it stands is beautifully landscaped and private, allowing a setting which adds to the character of the house.